I wasn’t prepared to fall in love with Maine, but I fell quickly and hard. It started innocently enough….short family trip to a small town. I knew that Maine was different when I stepped off the plane in Bangor and everything was so much easier than any other airport that I had been to in years. It was small, welcoming, and easy to navigate. We got in our little blue rental car and headed to Camden. We drove past beautiful small towns, fishing villages and fragrant forests…that is what is one of my favorite things about Maine…the heady smell of pine and sea air. We arrived at a grey shingled mansion built in the 1800’s for a wealthy family to escape the heat of Boston. This “summer home” was now converted to a sunny bed and breakfast. We were given a tour of the grounds and we were shown into the large, Victorian kitchen and presented with a big cookie jar filled with freshly baked, chocolate chip cookies and we were invited to raid the cookie jar any time of the day or night! That set the tone for the whole trip. We walked into town past lovely homes and well-tended gardens filled with the flowers of summer. We past the Camden harbor filled with all manner of boats…large and small sail boats, motor boats and, of course, fishing boats. View from the end of our street. We meandered our way to a small restaurant that had been recommended. As soon as we sat down, we were served a lovely basket of blueberry muffins. I will always remember that day and those muffins. 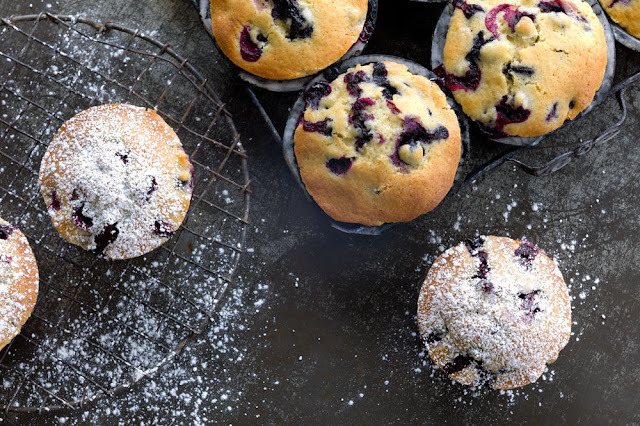 They were small, warm muffins brimming with fresh blueberries. In the years to come we would return to Maine often. We would rent a tiny, apartment with a large deck where you could sit under the stars and view “where the mountains meet the sea”. We would cook many Sunday suppers there with fresh ingredients purchased from the farmer’s markets. Blueberries found their way into many of the dishes we prepared. 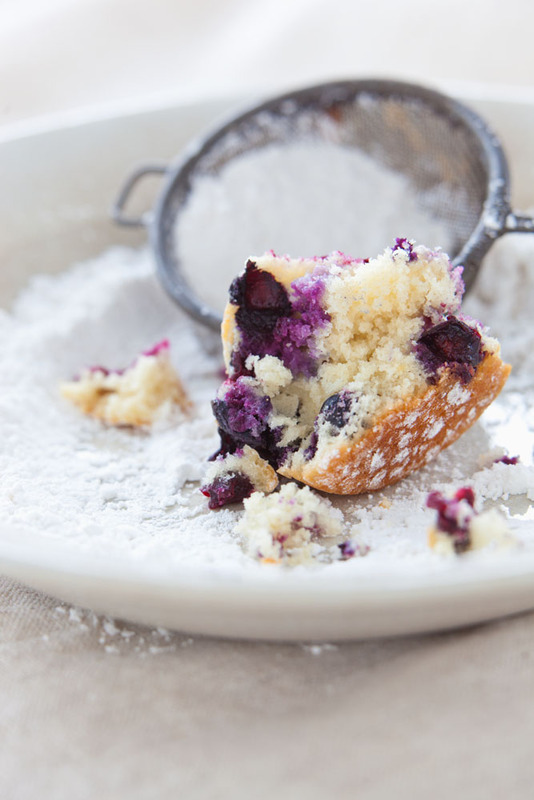 This is my adaptation of the blueberry muffins from Down East. Preheat oven to 400 degrees F. Grease muffin cups. Line with paper liners if you like. Sift together flour, baking powder, sugar and salt. Blend in the lightly beaten eggs, vanilla, milk and melted butter. Do not over mix. Carefully stir in the berries. Spoon batter evenly into muffin cups. Bake 25 - 35 minutes or until golden brown. Remove from pan and let cool. Dust top with confectioner's sugar. Serve warm, if possible. It was nice to meet you at the FBF this w/e. Your blog is lovely and photos are really good. I've just added it to my reader. Interestingly, with all that I've traveled, I've never been to Maine (or Vermont). Maybe next summer. 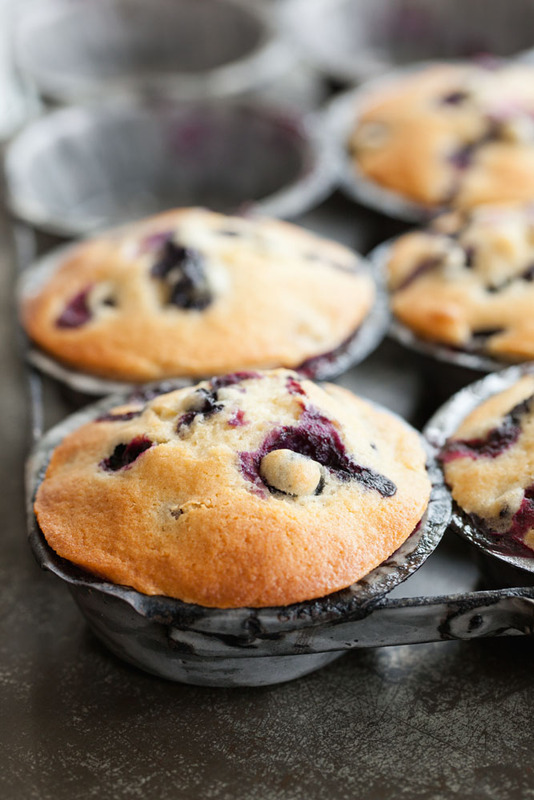 Blueberry muffins are one of my favourite things! When I don't feel too lazy,I sometimes like to add some fresh lemon zest. These look delicious!! !